Everything that could have gone right for Obama in 2008 did go right, and yet he still only won North Carolina by just 14,177 votes -- a tiny sliver of the 4.2 million cast statewide. Thanks to his campaign's striking ability to expand the Democratic electorate, Obama even managed to win the state while losing independents to John McCain. Volunteers blitzed college campuses and dominated the early voting game. New African-American voters were registered in huge numbers. Obama also performed better among white voters than both John Kerry and Al Gore. 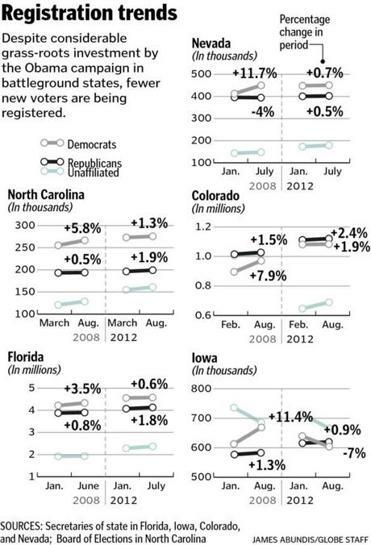 Crucially, Republican turnout fell off dramatically from 2004. Obama world read the victory as a promising sign of Democratic realignment in the South and rewarded the Tar Heel State with the Democratic National Convention, which will take place in Charlotte in September. Today, though, it's hard to find a Democrat in the capital of Raleigh who believes the president, saddled with the burdens of governing and a sputtering economy, can stir the enthusiasm of 2008 and repeat his near-flawless North Carolina performance. Even the slightest shifts in turnout can determine the race, a prospect relished by Republicans, who were hamstrung in the last election by dampened conservative enthusiasm and a superior Democratic ground game. The Romney campaign recently moved a state director to Raleigh and is piggybacking off the early joint efforts of the North Carolina GOP and the Republican National Committee, which have opened four field offices so far. Once a bright spot for President Barack Obama, North Carolina is now more like a political migraine less than four months before Democrats open the party's national convention in Charlotte. Labor unions, a core Democratic constituency, are up in arms. Democratic Gov. Bev Perdue isn't running for re-election; Democrats say she was likely to lose. The state Democratic Party is in disarray over an explosive sexual harassment scandal. Voters recently approved amending the state constitution to ban gay marriage, a position that runs counter to Obama's. And unemployment in the state remains persistently high. North Carolina represented the high-water mark for the great Obama wave in 2008 — but he’s swimming against the tide there in 2012. No state better illustrates the challenge Barack Obama faces in trying to consolidate the historic gains of his 2008 campaign at a time when hope, change and optimism have been supplanted by anger, skepticism and disillusionment. It’s not merely that fewer than 45 percent of state voters approve of the job performance of the president who’s set to land there Tuesday, or that the state’s unemployment rate is pushing double digits. Or that both houses of the state Legislature flipped from blue to red in 2010. Or even that a former top state Democratic official recently resigned amid accusations he sexually harassed a male staffer. Obama’s Achilles Tarheel is the general lack of enthusiasm, especially among younger voters, that threatens to reverse his historic win in 2008, depriving him of a key part of his own map and imperiling his party’s tenuous foothold in the upper South. The conventional wisdom has become that Romney’s the favorite in the state. But no one is predicting that Romney, who is having as much trouble connecting with working-class voters as Obama, will pull too far away in a state with 3 million Democrats, 2 million-plus Republicans and 1.5 million independents. When Democratic pollster Public Policy Polling reported good news last week — President Obama holds a 5-point lead in this most challenging of swing states — the Raleigh-based firm felt compelled to add a buzz-kill disclaimer: “It’s unlikely,” they declared, that Obama will win by that much, if at all. This year will not be like 2008, at least as far as the electoral map is concerned. Let’s start with the states that are genuinely a tossup. Our analysis suggests that nine of them fit well in that swing category: Colorado, Florida, Iowa, Nevada, New Hampshire, North Carolina, Ohio, Virginia and Wisconsin. Republicans will, rightly, point to history in these nine states — a view that suggests at least the possibility that Obama’s 2008 victory was anomalous. Before his wins in 2008, Colorado, Florida, Nevada, North Carolina, Ohio and Virginia had all voted for the Republican presidential nominee in the previous two elections. If all six of those states revert to their 2000/2004 form, Republicans carry Indiana (as seems likely) and Obama wins no other state that he lost in 2008 (as seems likely), the incumbent would drop to 258 electoral votes and lose the presidency. But if Obama wins any one among Florida, North Carolina, Ohio or Virginia, he will be reelected. If Romney can turn Wisconsin — and its 10 electoral votes — or Michigan (16) or Pennsylvania (20) to his side while also winning the vast majority of the six swing states mentioned above, he will have a bit more wiggle room for a national victory. There’s no doubt that the 2012 playing field will be narrower than the one Obama dominated in 2008. But the president still retains far more flexibility than Romney in building a map that adds up to 270 electoral votes.